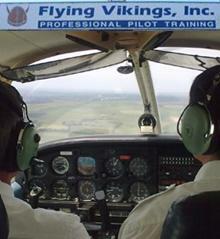 November 30, 2010 - The Federal Aviation Administration (FAA) proposes to assess a $221,650 civil penalty against Flying Vikings, Inc. (FVI) a flight school in Hayward, California for allegedly failing to complete the required training for its staff and failing to maintain training records, as required by Federal Aviation Regulations. Flying Vikings is a flight training school located at Hayward Executive Airport in the San Francisco Bay Area, and at Rancho Murieta near Sacramento, California. The school was established in 1989 providing flight training from private pilot to ATP and flight training to I-20 to foreign students. The FAA alleges that from Feb. 1, 2008 to Oct. 23, 2008, the school did not have a chief instructor, assistant chief instructor or instructor who had completed an approved list of training or refresher courses within the previous 12 calendar months, as required by Part 141 of the FAA regualtions. There are two types of schools. One is normally referred to as an "FAA-approved school" part 141 and the other as a "non-approved school. part 61" Enrollment in an FAA-approved school usually ensures a high quality of training. FAA-approved schools meet prescribed standards with respect to equipment, facilities, personnel, and curricula. However, many excellent pilot schools find it impractical to qualify for the FAA certification, and are referred to as non-approved schools. One of the differences between FAA-approved schools and non-approved schools is that fewer flight hours are required to qualify for a pilot certificate in an FAA-approved school. The requirement for a private pilot certificate is 40 hours in a non-approved school, and 35 hours in an approved school. However, since most people require 60 to 75 hours of training, this difference may be insignificant for a private pilot certificate. A FAA approved flight school is regulated under part 141 of the FAA regulations. The school has an approved flight school training syllabus and each student must have adequate personnel, including certificated flight instructors, certificated ground instructors and a chief instructor for each approved course of training who is qualified and competent to perform the duties to which that instructor is assigned. During that time period, Flying Vikings flight school was a part 141 approved flight school, the school provided training to 20 students and graduated 10 of them. The FAA reviewed student records and training during the time the school was not in compliance, and took appropriate action when it found discrepancies, including revocation of one pilot certificate. The FAA also alleges that the school failed to properly maintain and certify the training records for 11 students between Feb. 1, 2008 and Sept. 10, 2008. Section 141.89 which generally provides in relevant part that the holder of a pilot school certificate may not provide training to a student who is enrolled in an approved course of training unless each chief instructor, assistant chief instructor, check instructor, or instructor meets the appropriate requirements of Part 141. Section 141.101(a), which generally provides in relevant part that each holder of a pilot school certificate must establish and maintain a current and accurate record of the participation of each student enrolled in an approved course of training conducted by the school that includes, among other things, the date that the student graduated, terminated training, or transferred to another school. Section 141.101(d), which generally provides in relevant part that the holder of a pilot school certificate must retain each student record required by this section for at least 1 year from the date that the student either graduates from the course to which the record pertains, terminates enrollment in the course to which the record pertains, or transfers to another school. Each instructor to be used for ground or flight training must hold a flight instructor certificate, ground instructor certificate, with ratings for the approved course of training and any aircraft used in that course. ?Good solid basic training and accurate pilot records are the foundation for pilots to operate safely throughout their flying careers,? said FAA Administrator Randy Babbitt. ?We expect flight schools to help provide that solid safety foundation.? Flying Vikings had applied for renewal of their Part 141 certificate in October 2008. However, the FAA rejected their application as a result of the company failed to maintain personnel, aircraft, facility, approved training courses and training records to Part 141 minimum standards. Under 49 U.S.C. 46301(a)(5), Flying Vikings is subject to a maximum civil penalty of $11,000 for each of the violations. The FAA has offered a settlement of $221,650.00. Flying Vikings may participate in an informal conference with an FAA attorney, and provide additional information to the FAA for consideration. Flying Vikings, Inc., has 30 days from receipt of the FAA?s enforcement letter to respond to the agency.